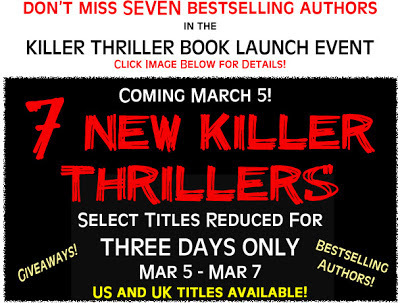 Laurie Here - Contemporary Fiction and MORE - Book Reviews: Pre-Event FESTIVITY with a Guest Post by Claude Bouchard as we get ready for 7 NEW KILLER THRILLERS event for March 5th to the 7th! Pre-Event FESTIVITY with a Guest Post by Claude Bouchard as we get ready for 7 NEW KILLER THRILLERS event for March 5th to the 7th! Click here on this LINK: http://bit.ly/KillerThrillers to go to the ABOVE for MORE info! See below, too, after the Guest Post! BUT FIRST, read on! One of the authors from one of the books has a Guest Post for us! Not only this, but I will have another on March 3rd, and two more on the first 2 days of the event! Make sure to bookmark this blog or mark your calendars to come back to catch these amazing Authors' Guest Posts! So here is our first one! The Boeing 777-300 came to a halt at Gate B59 of Roissy-Charles de Gaulle Airport’s Terminal 2A at 8:14 a.m. and Air Canada flight AC870 had arrived, sixteen minutes ahead of schedule. The flight referred to in that sentence exists and the plane is really that particular model. Even the gate and terminal information are accurate. The sixteen minute thing, I made up just for fun. About two months ago, friends from Australia informed me they would be vacationing in Vietnam come spring and suggested we might do the same and hook up with them. My wife and I found this to be a terrific idea and started looking into flight possibilities. From past experience, I knew that flights to Asia from Montreal generally involve connecting in NYC, Chicago or Vancouver then heading west for twelve to fourteen hours over the Pacific. The weird part is getting closer. My first stab at writing was in 1995, the result being my first novel, Vigilante. This was subsequently followed by The Consultant (1996) and Mind Games (1997), all of the same series. Professional obligations and other creative interests led me away from writing for a number of years but I found myself busy at the keyboard in 2009 with The Homeless Killer after having finally published my first three novels. I then followed up with 6 Hours 42 Minutes in 2011, also part of the Vigilante series born from Vigilante. In July 2011, I released ASYLUM, my first stand-alone novel and Discreet Activities, my sixth Vigilante crime thriller was published in January 2012. In October 2012, I penned and released Something’s Cooking, a faux-erotica parody and cookbook under the pseudonyms Réal E. Hotte and Dasha Sugah. I think I'm really starting to like this writing thing. My eighth novel and seventh installment of the Vigilante series, Femme Fatale, has just been released. SPECIAL THANKS to Claude Bouchard! Wow! Besides writing, he sounds like a lot of fun, too! He has a lot of fun and unique interests! I LOVE getting to know authors, don't you? Come back on March 3rd for another Guest Post! Thanks for coming by, everyone! Leave a comment if you would like to!